A session in which the open and close on a Japanese candlestick are the same (or almost the same). 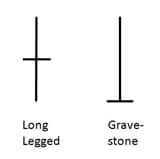 There are different varieties of doji lines (gravestone, dragonfly, and long-legged doji) depending on where the opening and closing are in relation to the entire range. Doji lines are among the most important individual candlestick patterns. They are also components of candlestick patterns. Northern doji are doji that appear during a rally. Southern doji are doji during declines.